Early birthday: Members of the 15th Marine Expeditionary Unit marked the Corps’ 237th with cake aboard dock landing ship Rushmore on Nov. 7. The MEU is deployed in the U.S. Central Command region with the Peleliu Amphibious Ready Group. When it comes to marking the Marine Corps’ 237th birthday, customs and tradition make the decision of what to do much easier. Commandant’s birthday video message? Check. Reading of Maj. Gen. John A. Lejeune’s 1921 message? Check. Ceremonial cake? Check. Then there are the birthday balls and pageants where Marines and their significant others get all spiffed up to celebrate their history and remember those lost in battle. This past week, and for some units over the course of several weeks, Marines in different climes and places stopped for a little while to mark their history and celebrate their shared Nov. 10 birthdate. 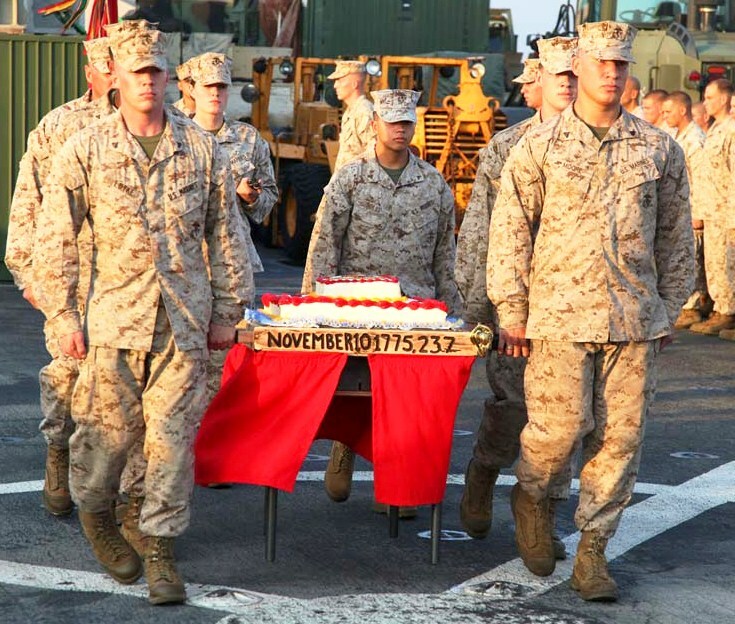 Marines deployed overseas, like the 15th Marine Expeditionary Unit, rolled out the birthday cake for flight-deck ceremony aboard dock landing ship Rushmore a few days ahead off the official birthday. In Afghanistan, members of Heavy Helicopter Squadron 361 marked the birthday Nov. 6 with a cake-cutting ceremony on the tarmac at Camp Bastion in Helmand province. Some Marines will mark the birthday this weekend helping with Hurricane Sandy cleanup efforts in New York and New Jersey. In New Orleans, La., several hundred leathernecks with Marine Forces Reserve and Marine Forces North marked the birthday Nov. 7 with a traditional run. In Houston, several Marine Corps recruiters in the area plan a birthday run, too, with their neighbors and friends. 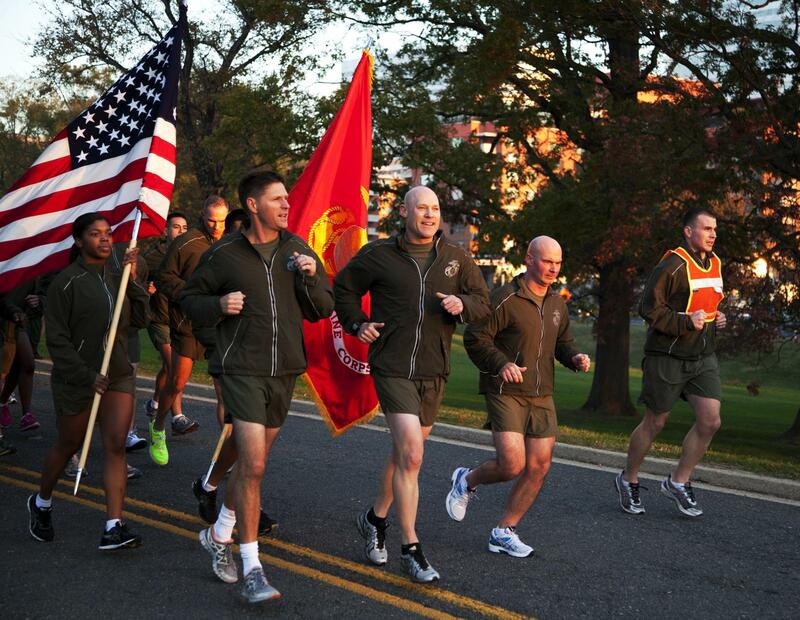 In Arlington, Va., Sergeant Major of the Marine Corps Micheal Barrett joined Marines for a birthday run Nov. 9 to the Marine Corps War Memorial, aka the Iwo Jima statue, and back to the Pentagon where they held the cake-cutting ceremony. Before they turned around, though, they belted out the Marine Corps Hymn. And it’s not all about running off those cake calories: In Japan, Marines and others were logging 237 laps in the pool at Iwakuni Marine Corps Air Station, this month as part of a swim competition sponsored by the local Marine Corps Community Services. One person even did the full 237 laps, in one day, according to Stephanie Brown, the MCCS aquatics manager. A Marine, presumably? If “Once a Marine, Always a Marine”, then why must a retiree HAVE to be invited? Shouldn’t they “never be forgotten” and simply granted the opportunity to send in the appropriate funds to secure what should be a secured seat for the Marine and their loved one at the annual ball closest to them ~ or, for that matter, of their choosing?